Anyone who shares their lives and homes with dogs or cats can tell you that they all love to Help. And they are Very Helpful Indeed. Animals like to Help with all kinds of tasks and chores, whether it's sorting laundry or cooking dinner or raking leaves. I think there’s some kind of Universal Furry Helper Law at work, as well: the amount of Help you need from your furry friends is in inverse proportion to the number of animals who feel the need to Help. For example, when I’m making dinner, there are at least 5 noses, 10 eyeballs and 20 paws in attendance, all there to help test the food or at least, clean the floor. I don't really need that kind of help when I cook. Too many chefs spoil the broth and all that. Yet I could really use Help cleaning the litter box or putting dog toys away. Though, admittedly, the dogs sometimes Help. But there’s a bit of disagreement in the task assignments, based on the definition of “away.” Or how exactly I want to clean the litter box: the cat poo goes in the toilet, not in the dog. Below are a few pictures of my furry friends--past and present--Helping. 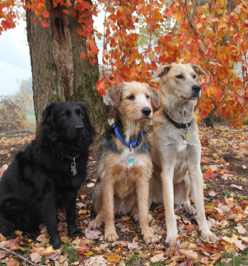 Lilah, Tucker and Jasper Help with the yard work. Here, they are Inspecting the tarp we use to move fallen leaves and other yard debris into our compost pile. All three are Very Thorough Inspectors. After this picture was taken, they gave the all clear sign by running around and biting each other. Lilah and Jasper are also a big Help when it comes to raking leaves. I rake them, and then they charge through the piles, crunching up the leaves into little itty bits. Makes it better for composting I think. At least that's what the dogs tell me. 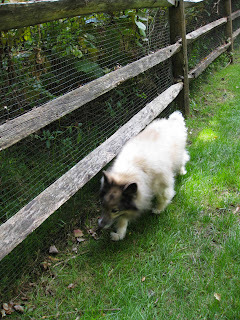 Pasha's favorite way to Help was to patrol the yard. It needed to be Safe. From Birdies. And Squirrels. And Deer. Or there may be a Skunk, which would have to be investigated. 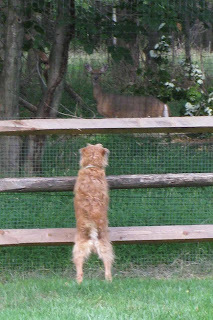 Rosie Helped protect the yard from Evil Deer. Because you never knew about Deer. 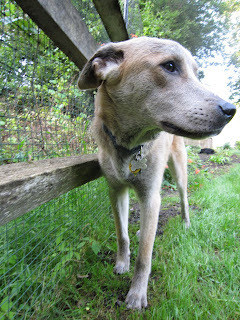 Sometimes they didn't even run away when you barked at them, which is Highly Suspicious Behavior. With Pasha and Rosie no longer with us, Jasper has taken over patrol duties. Though Tucker also Helps quite a bit; he tries to bark the Deer away as well, but as Rosie found out, they don't always listen. Which calls for more barking. Of course. All the animals are very good at Helping inspect packages. Particularly gift bags. 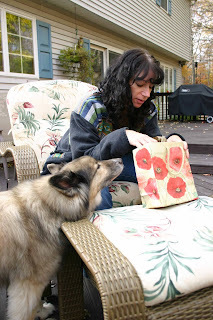 Here Pasha performs a sniff test on a birthday gift. 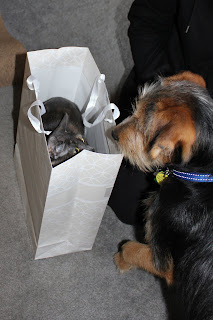 Rosie was the Biggest Help with gift bags. 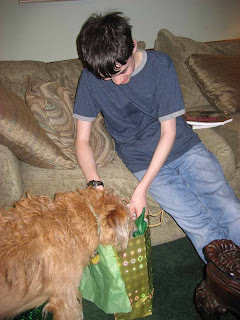 Not only did she inspect them, but she often contributed to the gifts, by dropping a wet, shlorby ball into the Best Bag. Then you had to take said slimy ball out the bag, remove the stray bit tissue paper that clung to it, and then Throw the Ball. That was part of the experience. 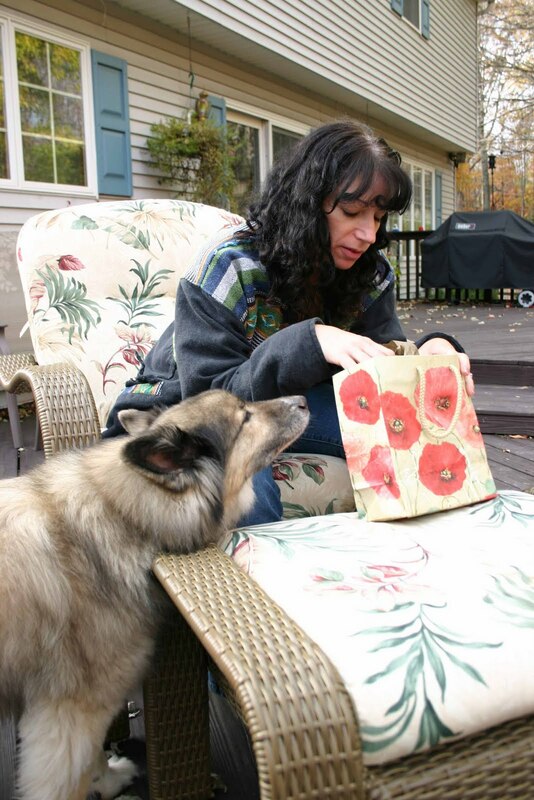 Athena also Helps with bags, though, in her opinion, the only way to truly inspect them is from The Inside. Here, Tucker is Inspecting the Inspector in the bag. Everybody Helps. Everybody chips in when there's a big occasion, particularly; if there's food involved like on Thanksgiving or Passover. Dawn and Athena Help by checking out the groceries. Every bag must be investigated to make sure we got the right stuff. Um, excuse me, where's the cat food? 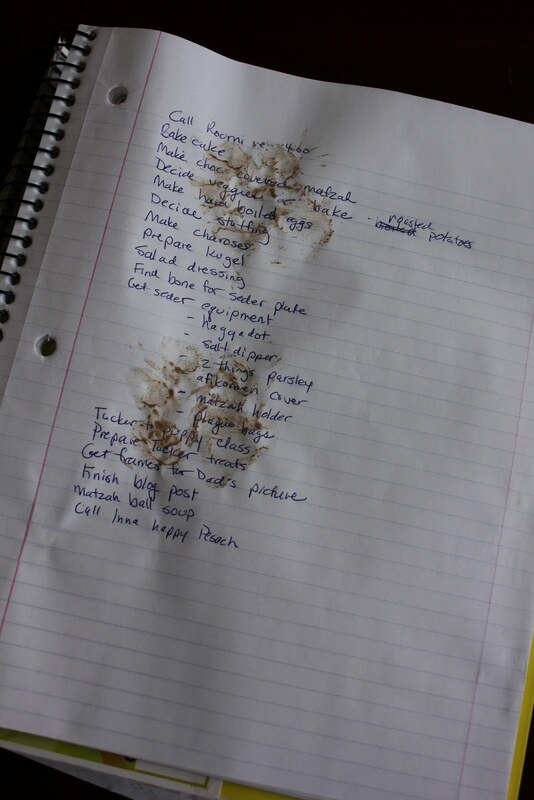 I believe it was Tucker who Helped me with my list of things to do to get ready for Passover this year. While "Take Tucker to puppy class" was on this list, there was no entry for "Give Tucker a treat" or "Belly rubs for Tucker" or even "Take Tucker for a walk." Do-over! What's the wet stuff coming out of the sink? Athena Helpfully points out the water that needs to be addressed before guests arrive. Surely they wouldn't want wet paws? Here, Athena is Helping me get the good plates out of the buffet. I think she's checking to make sure they're all there. 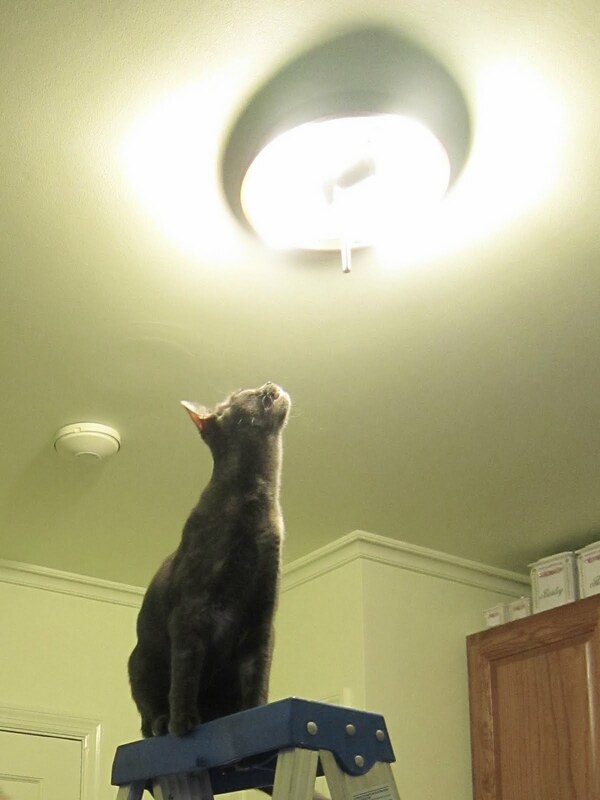 Though there's a mysterious absence of cat food bowls. 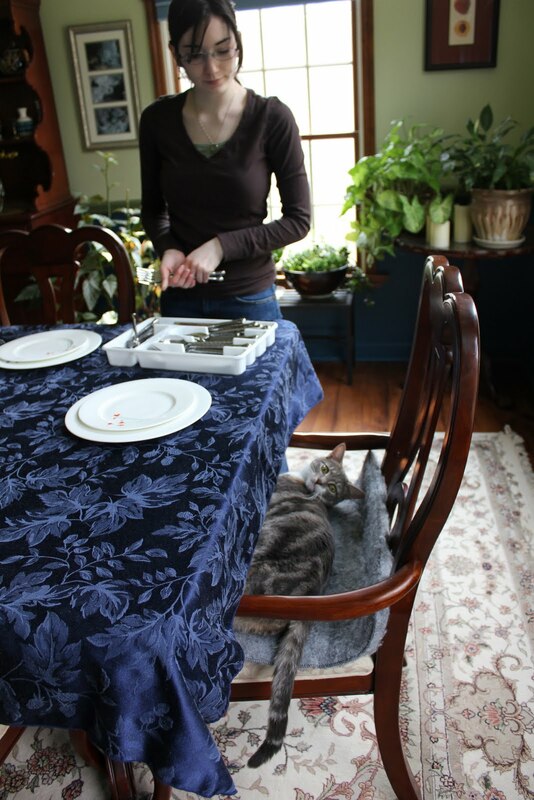 Setting the table: one of the many Helpful things Dawn does. Though technically, she's just setting--or maybe reclining--by the table. Corinne is actually putting plates and silverware and napkins on the table. Mere technicalities. At Thanksgiving, Athena presides over the turkey cutting, Helping Brian with that task. And by Helping, we mean observing carefully in case there are mistakes and of course, she's there for any tasting that might need to take place. Athena is Very Helpful that way. 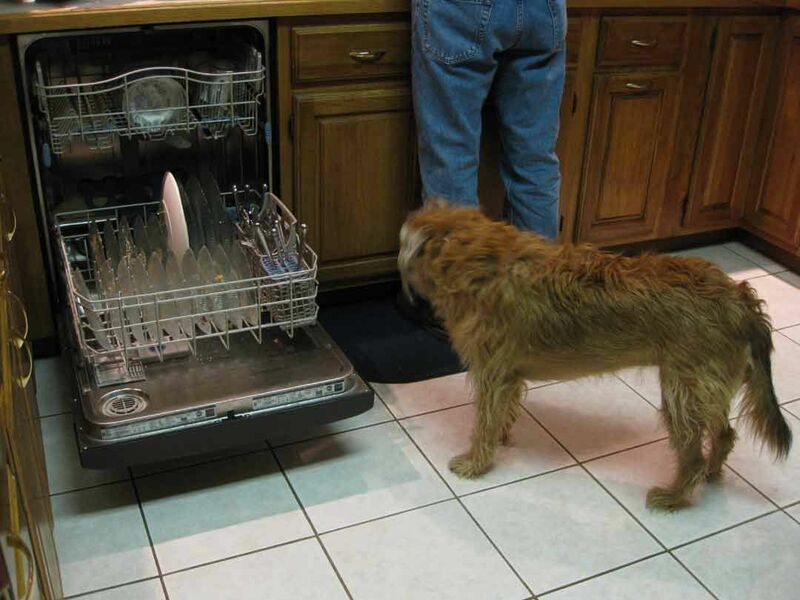 Rosie always Helped Brian do the dishes. Sometimes she just watched to make sure he was doing it right. Other times, she Helped by prewashing the dishes before the dishwasher was turned on. Then the dishwasher didn't have to work as hard. All the animals love to help with the laundry. Rosie used to Help me carry the clothes downstairs to the laundry room by grabbing on to anything dangling or dragging as I walked, and tugging. She also loved to sleep in the pile of dirty laundry while I sorted it. Our current pets aren't quite as involved in that area, but they do love to Help. 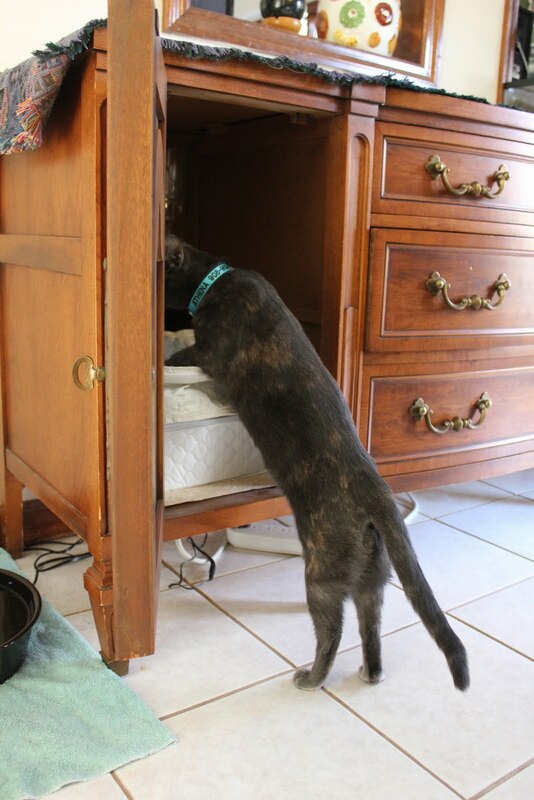 Athena makes sure that the clothes in the hamper are the correct ones and that they do, indeed need to be washed. 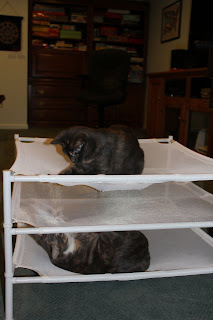 Both cats Help test out the stackable drier, where we lay out our delicate clothes. Yep, it looks like it will stand up to any item of apparel with sharp pointy edges. After all the clothes are clean, Dawn disappears into the closet to help put things away. Walking along the tops of the hangers is Very Helpful because that way she can make sure everything is properly hung up. There are so many ways our furry family members help around the house. 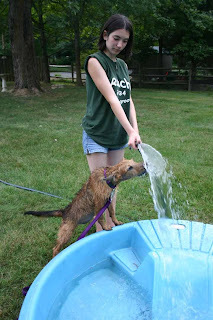 Rosie Helped fill up the pool. She was a great water taste tester. 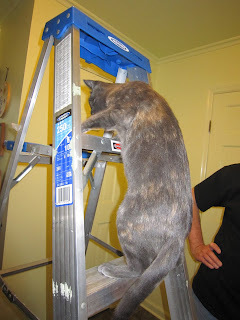 Athena climbed a ladder once to Help Brian change some light bulbs. Both cats love to help me work in my office. Rearranging my pens--moving them from desk to floor in particular--is Very Helpful. Ensuring that the paper comes out of the printer is another task that is best performed by cats. They know about sneaky little creatures that hide in dark places. You never know when another page will come out of that electronic cave! When we're all done with chores, Athena will Help us relax by choosing the Best television program to watch. One about birds would be good, don't you think?